An escaped Jiridian takes Lili hostage. Their shuttle is sucked on to a Kimera ship where they, with Liam, have to go through an obstacle course to get to the core to exit. Agent Ronald Sandoval: Some things are best left unsaid, or unseen. Major Liam Kincaid: Thanks for the advice, but this is one memory I'd like to keep. Agent Ronald Sandoval: The problem with memories, Major, is that once you have them in your mind, it's very difficult to get rid of them. This show has humbled a skeptic. I have to say that I wasn't fair to this show in the beginning, and it still isn't my favourite, but after having watched it for a while I grudgingly admit it is the best science fiction on television. That's right, science fiction, not sci-fi. 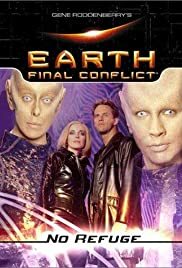 The aliens are prissy, the characters are flat (except for Sandoval, who's evilly likeable), and the special effects are imperfect, but each episode deluges it's viewers with the everyday application of real, well-thought out science centuries beyond our own. More research goes into five minutes of this show than an entire season of "Andromeda." There are an average of two amazingly ubiquitious special effects shots a minute. And whereas in almost every other series the tendency of the storyline to return to an unchanging equilibrium is a stumbling block, here it is done so brilliantly one ends up marvelling at how the writers pulled it off. I don't care if it ends or not (because, as I said, the story almost never deviates, so it could really end at any time), but I will agree that it's a hundred times better than any "Star Trek" series every was, and deserves to be Gene Roddenberry's most remembered idea. And it's distinctly Canadian feel, similar to and yet different than that of "The X-Files," makes it a great showcase for this fantastic country! Let's hope Paramount goes bankrupt, the Trekkies find real lives for themselves, and history can base it's opinion of Mr. Roddenberry on fact rather than fandom.